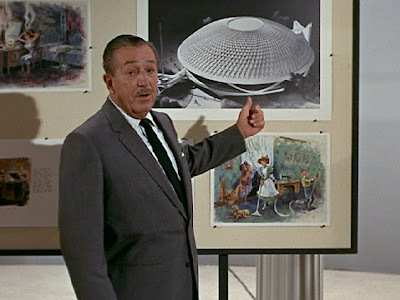 Disney produced attractions for many companies during the 1964/1965 New York World's Fair. One of these attractions was the Carousel of Progress for the General Electric Pavilion showing, "how life has changed through electrical energy." Below is a clip from a short promotional film Disney produced. The film was not intended for the public but rather General Electric, who had not yet heard the featured song of the attraction, "There's a Great Big Beautiful Tomorrow." Also, unconfirmed rumors are circulating that Carousel of Progress will be entering the Smithsonian in 2009 along with the Enchanted Tiki Room but you didn't hear it from me. Walt Disney had such a magical presence about him. It's a shame he's gone.